Creative Materials Corporation, a supplier of tile, brick, stone, paver systems, and other related building materials for the commercial construction industry, is celebrating 25 years of serving architecture firms, developers, and corporate multi-unit brands. 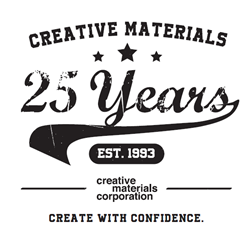 Creative Materials Corporation was founded in Albany, NY in 1993 by Don and Michele Kellish. Between 1996 and 2007 Creative Materials grew exponentially, as the concepts the company introduced into the marketplace were well received. Creative Materials expanded into two new offices and added product categories and services. Most notable was the ability to supply corporate multi-unit brand clients with consolidated tile and setting material packages that would deliver within 2-3 days. In 2010, to meet the increasing demands of the market, the Boston Design Center added Creative Materials to its list of occupants. In 2013, Don and Michele’s son-in-law, Ryan Micklus, joined Creative Materials as executive vice president. The company began to expand into new markets and territories and add on to its executive team. After several years of solid company performance and expansion, Ryan Micklus was promoted to president. Although times have changed, Creative Materials continues to expand by following a commercial-only, client-first strategy that has been engrained since day one. Today, Creative Materials operates out of six metropolitan areas including New York City, Washington D.C., and Los Angeles. The company supplies consolidated tile and setting material programs to many brand clients including five of the top ten restaurant chains (by unit growth in 2017). Creative Materials is proud to have supplied award-winning commercial projects such as the Columbus Ohio Metropolitan Library and Novartis Institutes for Biomedical Research, Cambridge Campus. Visit http://www.creativematerialscorp.com to learn more about Creative Materials Corporation.